All proceeds from the sale of this book will be donated to charities. Ever wonder how drug prices are set and why? The Strategic Pricing of Pharmaceuticals will take you through the complex world of pharmaceutical and biotech pricing in a clear and straightforward manner. With a focus on practical, value-based pricing, The Strategic Pricing of Pharmaceuticals explains the different types of value that a medicine can provide, how different customers interpret and understand value, and the ways in which the marketer can capture that value through pricing. Unlike other books in this area, which tend to be more theoretical than practical, this one explores and explains how medicines are priced as well as how they should be priced, how those prices are perceived in the marketplace, and how prices affect sales, as well as the many factors that must be considered in setting and managing the prices of medicines. The Strategic Pricing of Pharmaceuticals begins with a discussion of how pharmaceuticals and biopharmaceuticals are different from other products in terms of value and why typical assumptions and approaches to pricing fail to consider the true nature of pharmaceuticals or to capture their value. This book provides pharmaceutical marketers with needed guidance through the use of in-depth discussions and analyses of the factors that should be considered when setting and managing pharmaceutical prices. Every aspect of the pharmaceutical pricing world is addressed: generics, contracting concepts and details, management of the pricing process, pricing research, pricing outside the US market, setting the price for new products, and considerations for the future of pharmaceutical pricing. With chapters focusing on competitive issues, insurance reimbursement, medical decision making, and the often overlooked company-specific factors that drive many pricing decisions, this book provides the reader with insights, useful advice, and knowledge that cannot be found elsewhere. Marketing, economics, and pharmacy students, as well as marketers and industry executives, can gain a better understanding of the "how and why" of appropriately pricing pharmaceuticals—and how to avoid dangerous pitfalls along the way—by reading The Strategic Pricing of Pharmaceuticals. Kolassa has done it again. He has created a book that will be word one in pharmaceutical pricing by identifying the good, the bad and the irrelevant. Mick has identified and clearly presents the practical linkages for successful pricing in what can be a very complex and perhaps too technical field. His practical examples and systems of value forms a solid foundation for better pricing theory. A great read! The chapter on "The Role of Value in the Pricing of Pharmaceuticals" is a must read for the various constituents of pharmaceuticals. This topic is important as understanding how people form value judgments in the very complicated area of medicines and drugs does not necessarily correspond to what is generally assumed in economic theory or perhaps what has been assumed by those involved in the pharmaceutical industry. Overall, this is a very insightful and highly informative book and one that should be a must read for anyone who is involved in and with the pharmaceutical industry. E.M. (Mick) Kolassa is Chairman and Managing Partner of Medical Marketing Economics, a global firm that develops value based strategies for pharmaceutical and biotechnology companies. Mick is recognized internationally as the leading expert on pharmaceutical pricing and value-based strategies. He also serves as Adjunct Professor at the University of Mississippi and the University of the Sciences in Philadelphia, and is former Associate Professor of Pharmacy Administration and Marketing at the University of Mississippi. He was editor of the Journal of Pharmaceutical Marketing & Management and authored several articles and book chapters on pharmaceutical marketing and pricing issues. He is coauthor of the book Pharmaceutical Marketing: Principles, Environment, and Practice. 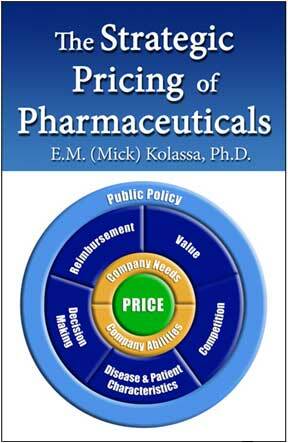 Dr. Kolassa’s first book on pharmaceutical pricing, Elements of Pharmaceutical Pricing, was published in 1997. Mick also served as Director of Pricing and Economic Policy at Sandoz, and has held positions at The Upjohn Company, the Strategic Pricing Group, and Hastings Healthcare. Mick holds an MBA from Eastern Washington University and a PhD from the University of Mississippi. Jack Mycka is President, Global CEO and Partner at MME. Since 2001 Jack has provided critical support for strategic marketing and pricing decisions in the biotech and pharmaceutical industries in many product classes and therapeutic areas centered on value and its interaction with pricing, payers, reimbursement, and marketing in general. His expertise in pharmaceutical pricing was first developed while serving as the Director of Pharmaceutical Pricing and Contracting at Roche Laboratories Inc., in Nutley, NJ. Previously, Jack spent ten years as a commercial banker. Jack received a BS in Finance from Lehigh University. William Lobb is a Vice President & Partner at MME, where he heads up the firm’s quantitative marketing and pricing research arm. His community pharmacy experience includes management at several levels. Bill has been a leader in state and national pharmacy associations, including the American College of Apothecaries, where he developed and finalized products to improve the profitability of independent pharmacy practice. He graduated from the University of Texas, College of Pharmacy and holds both an MS and Ph.D.in pharmaceutical marketing from the University of Mississippi. Kevin Patterson is a Vice President & Partner at MME, whose background is in finance and health systems management. He was Director of Finance for Ambulatory Operations for a major hospital system, and Director of Healthcare Strategies for a large accounting firm. Kevin holds a Masters in Accountancy from the University of Mississippi and is a certified public accountant. Doug Paul is a Vice President & Partner at MME, where he focuses on market assessments and orphan drug issues. He has been active at the national level with various pharmacy associations and played a key role in the development of the American College of Veterinary Pharmacists. Doug earned his PharmD and an MS in pharmaceutical marketing from the University of Mississippi. Brian Reisetter is a Vice President & Partner at MME. A former hospital pharmacy director and pharmaceutical sales representative, Brian is a recognized leader in researching community pharmacy. He has a Bachelor of Science in Pharmacy and an MBA, both from Drake University, and a PhD with an emphasis in pharmaceutical marketing from the University of Mississippi. Renato Dellamano is President of MME Europe. Dr. Dellamano, who founded ValueVector, a strategic pricing consultancy, was also Head of Strategic Pricing at the global Headquarters of the Swiss pharmaceutical giant Hoffmann-La Roche, and served as Global Controller of the Pharma Division of the same company. A Health Economist and a former professor of Hospital Management, Renato received his Doctorate from Bocconi University of Milan, and specialized in health economics at the CERGAS - Center for Research on Health Care Management. Chapter 1: Why is Pharmaceutical Pricing Different? Why is Pharmaceutical Pricing Different? A fool knows the price of everything and the value of nothing. Few things are as maligned, misunderstood, and mischaracterized as the pricing of pharmaceuticals. Economists, when applying basic economic theory to pharmaceutical markets, are either thwarted or develop spurious models of questionable value. Lawmakers, eager for a populist soapbox, criticize pharmaceutical pricing, and pass laws that complicate it, without understanding the issues and forces that drive prices in this unique market. The market for prescription pharmaceutical products differs substantially from most other markets in a number of important ways. Typically, markets operate in response to consumer demand, which often can be affected to a great extent by marketing activities undertaken and prices charged by manufacturers and others. Customers, either businesses or consumers, often desire products that are heavily marketed for a number of reasons, not all of which might be considered rational. Pharmaceutical markets, on the other hand, exist only in response to the initial medical need for the relief provided by the product; they are prescribed by an individual not involved in the financial transaction of the actual sale; and they are consumed by another individual who, all things considered, would rather not need the product in the first place and may have no idea why it has been prescribed. This individual, the patient, may or may not have a direct role in the actual purchase of the product. This dynamic is in stark contrast to most markets, and therefore the role that price plays is decidedly different and traditional marketing and economic approaches to pricing cannot be relied upon. Prescription medicines are subject to derived demand. Products are demanded and sold in response to medical need. Their use is affected greatly by recognized standards of care, and an essential decision maker for prescription medicines is the physician, who neither consumes nor pays for the product. Prescription medicines are considered to be “negative goods,” in that those who purchase or consume them would prefer not to do so. Prescription medicines are experience goods, which means that their actual utility cannot be determined until they have been used, and their continued use depends on satisfactory experience. Prescription medicines are used in response to medical need, and the choice of medicine is made primarily by physicians. Another product that is subject to such “derived demand” and is selected by an agent working on behalf of the consumer is a college textbook. The professor determines what book or books will be best for the student in a particular course and then instructs the student to make the purchase. Usually, the professor has no idea of the price of the text, only its value. The text itself is selected based on the standards of the subject matter and the institution. The student has no choice in the selection of the text; he or she simply buys it and uses it as directed—or not. The process described for textbooks is almost identical to that for most prescription drugs with the caveat that the decision is made for each individual patient, not an entire class. In the same way that an instructor chooses college texts primarily on the basis of content, physicians decide which drug to use primarily on the basis of standards of treatment and medical principles, with price seldom affecting the initial product decision. Price, either the full price or the patient copayment, may play a role in the patient’s decision to have the prescription filled, just as the cost of a textbook may cause a student to fail to purchase that requirement, but it does not affect the initial decision to require purchase or prescribe use. And, as just mentioned, it may not be the price of the medicine itself that affects product use, but the price of the copayment, over which the manufacturer has little or no control. Attempts to apply basic economic and marketing theories to such a complex transaction are destined to fail. It cannot be stated more plainly than this: in general, pharmaceuticals are the most valuable health care intervention available. This statement is true in spite of all the claims that pharmaceuticals are excessively priced. As will be discussed later, it is the lack of third-party coverage for pharmaceuticals that has generated and perpetuated the myth that prescription medicines are overpriced. Studies have demonstrated the value of pharmaceuticals individually and in aggregate. Lichtenberg found that for each incremental dollar spent on newer pharmaceuticals, the health care system saved between $4 and $8 in overall costs (1). Pharmacoeconomic studies have also consistently demonstrated individual products’ value to the system. The benefits of pharmaceuticals cannot be overestimated. My grandmother passed away from complications of ulcer surgery. Today H2 antagonists, such as Zantac® and Pepcid®, and proton pump inhibitors (PPIs), such as Prilosec® and Prevacid®, have all but eliminated the need for such surgery. It is not difficult to identify changes in health care that have been driven by pharmaceuticals. Antibiotics have eliminated bacterial infection as a common cause of death. Thirty years ago, if a patient had cancer, you could be relatively certain of many things. First, the person was very likely to die in a short time. Second, treatment would make the person uncontrollably nauseated. Third, the patient’s hair was likely to fall out. Fourth, the patient would feel excessive pain and fatigue. Since then, improvements in chemotherapy have enabled more targeted treatment with much higher success rates and fewer side effects, such as hair loss. Lance Armstrong, the seven-time winner of the Tour de France, had testicular and brain cancer with a poor prognosis. Yet he fully recovered and became the greatest cyclist of his or any age. Improvements have been made in the treatments for chemotherapy-induced nausea and vomiting (CINV). Products such as the 5-HT3 antagonists (Zofran® and Anzemet®) have revolutionized the treatment of CINV, and Merck’s Emend® has recently extended the ability to control CINV. Procrit® and Aranesp® have enabled patients to avoid the fatigue associated with cancer and chemotherapy. Finally, significant advances in pain recognition, management, and treatment have been driven by advances in the therapies available, including Duragesic®, OxyContin®, and Actiq®. The ability of health care providers and patients to control other diseases has also significantly increased. The asthma market, once dominated by short-acting inhalers and theophylline, is now controlled by long-acting corticosteroids (Flovent®), long-acting agonists (Serevent®), combinations of the two (Advair®), and response modifiers (Singulair®). The list goes on and on. Diabetes, hypertension, erectile dysfunction, overactive bladder, restless leg syndrome, allergy, epilepsy, depression, and schizophrenia have all seen light-year leaps in therapeutic improvement because of pharmaceuticals. It should be clear that the value of pharmaceuticals is, in most cases, significant. Why then does the myth of overpricing continue to plague the pharmaceutical industry? Probably because consumers’ (including prescribers and payers) evaluation of a product’s price rests on the perception of value and the industry has not done as well in assessing and communicating the value of its innovations as it has in developing them. In examining the history of pharmaceutical pricing, we cannot find an example of “overpricing,” in terms of identifying a product whose market failure could be blamed on the high price. There are plenty of situations in which poor assessment or inadequate communication of value has led to a misinterpretation of the value-price relationship (e.g., FluMist,® BiDil® and Exubera®), but it was the products themselves or the misunderstanding of their value that led to the lack of commercial success, not the prices. Before delving deeper into the various aspects of value, we must first understand that the term “value,” as used in this book, is not a simple monetization of the benefits of a medicine. Value cannot be reflected totally in dollars and cents, despite what an economist might claim. Attempts to calculate value solely in monetary terms ignore important aspects of human behavior, as well as the various ways price influences purchases, regardless of value. The total lifetime cost of Nexium® therapy cannot reflect the value of not losing a loved one to the complications of ulcer surgery. The value of allowing a granddaughter to enjoy the company of her grandfather (and vice versa) is incalculable and thus impossible to apply to a pricing decision. Robert Heilbroner once noted: “Mathematics has given economics rigor, but alas, also mortis.” The economist, or pharmacoeconomist, who believes that value can be understood through mere mathematical calculation and the manipulation of sets of numbers misses the subtlety of value by foregoing the rigor of investigation and relying on the mortis. Pricing is the moment of truth—all of marketing comes to focus in the pricing decision. Regardless of the industry, setting the price for a new product is a difficult task, filled with uncertainty and risk. Despite the many types of research and the plethora of information that may be available to the pricer, one is never sure that the price is right. There is, in our experience, little that one can do to eliminate the uncertainty and allow one to set the “optimal” price, but there are steps that can be taken to minimize risk and, at the very least, increase the likelihood of a proper decision. Chapters 4 through 10 of this book detail the “Elements of Pharmaceutical Pricing,” issues that must be addressed when setting and managing prices. When incorporated into a comprehensive process for pricing analysis and decision making, they provide the best way to ensure that the pricing decision is fully informed and well-reasoned. These issues are summarized in Table 13-1. What are the current competitive alternatives? Do competitors have a history of responding to the pricing actions of others? What steps might competitors who feel threatened by this new product take? Will the symptoms or severity of the disorder affect price sensitivity? What is the position of the disease on the “radar screen” of the payer, provider, or public? What is the potential for patients to view the drug positively (i.e., as offering relief of symptoms, disease reversal, or cure)? How likely are patients to protest the price? Is the patient population likely to have trouble affording this new product? Alternatively, could affordability be a key feature of this product? What does this disorder cost the health care system and society? What is the potential to reduce this cost with the new product? What information will be needed to document and demonstrate any savings? What is the potential of this product to increase costs but improve outcomes? How satisfied is the market with current therapies? What role does price play in the decision to prescribe, dispense, consume, or purchase drugs in this category? How likely are prescribers to receive negative feedback on the cost of the drug? How is this product reimbursed? Who stands to make or lose money with the new product? Are there any elements of reimbursement in this area that are out of the ordinary? How vital is this new product to the future of the company or to a current franchise? Will the pricing of this product complicate, or be complicated by, the pricing of other company products? What would be the cost to the company of a pricing mistake for this product? Is senior management prepared to address controversy if the price is seen by the public as too high? Will senior management supply the necessary financial support to make an innovative approach to pricing successful? What is more important to the firm, the first or fifth year of sales? If you make a pricing mistake, would you rather price too high or too low? What is the likelihood that the price of this product will attract the attention of the press or of legislators? Pricing is a process, not an event, and our recommended approach to pricing new pharmaceutical products so that they produce maximum value to the firm consists of a series of analyses and reports that follow a product through its development and into launch. Undertaken as soon as a new product candidate enters the research pipeline, the pricing process helps firms better understand the commercial potential and ability of the compound so that the product can be launched successfully.Each step of the process requires the cooperation of two or more functional areas and their work and recommendations should be fully documented. In addition to providing an ongoing record of activities, issues, decisions and rationales that have influenced the pricing of the product, this documentation can help the firm learn from its mistakes and repeat its successes. The [pharmaceutical] industry has not been successful in halting the attacks, but on the other hand the attacks to date have not had much effect on the industry in terms of lessened prices or profits, or changes in operational procedures. Whether this stand-off can continue under current conditions and for how long is of course the dominant issue at hand. There is an old Arabic saying: “He who tells the future, even when correct, lies.” Therein dwells the danger of prognostication. A reading of George Squibb’s 1969 book chapter(1), quoted above, would have led many to believe that the end was near for the pharmaceutical industry. Fortunately, for all of us, it is still here. But when, if ever, will the doomsayers’ predictions come true? Twenty years ago, there were predictions that, in the very near future, MCOs would dictate virtually 100% of pharmaceutical product use, and they would use only the cheapest product. So what’s happened? The principal result of managed care’s entry into the US health care system was the dramatic increase in the use (and sales) of prescription medicines. According to J.D. Kleinke, noted health economist and entrepreneur, “One of the hallmarks of managed care in the United States has been the deliberately liberalized use of pharmaceuticals.”(2) A funny thing happened on the way to the future. Still, change is inevitable. Some changes in the pricing environment have taken place, and more will certainly occur. The advent of the Medicare Part D benefit has resulted in deep discounts to secure formulary placement, widening further the gap between list prices and actual selling prices. As I write this, the gap between list prices and selling prices is the subject of litigation at both the state and federal levels. The most certain result will be the end of the AWP … and good riddance! Outside the US, we see that Germany has implemented reference pricing for several classes of drugs, Canada has used pharmacoeconomic arguments to deny reimbursement of many new agents, the French and Japanese pricing authorities have forced price cuts and rebates for most drugs. In the US, we see that the cost of some new cancer agents has shot past $100,000 for a course of therapy. These are all major changes, coming from several different directions. The pharmaceutical industry has done little of consequence in response to these and other changes. Prices are still often set based on the results of faulty assumptions and flawed marketing research. They are managed with little regard for the long-term future of the company, and they are defended with the same arguments that haven’t worked for years. Fortunately for the industry, thus far, the changes and challenges have been minor, and rich research pipelines are still rewarded. But what new issues might change that? Ten years ago, when the first edition of this book was published, the prognostications I made were minor and almost inevitable. I predicted further consolidation of buyers, a narrowing of international price ranges, greater use of low price as a selling point, and continued demands for discounts. The one prediction that was only partially realized was the broadened use of pharmacoeconomics. In the mid 1990s the industry was abuzz over the prospect that pharmacoeconomics might help us identify, and justify, the right price for our products. For the most part, that has not occurred, despite the industry’s substantial investment in pharmacoeconomics. The response of participants in the US market to pharmacoeconomics hasn’t changed much since then. Pharmacoeconomics is still not trusted or relied upon, especially if the companies themselves perform or sponsor the studies. Some foreign pricing authorities use pharmacoeconomics to justify their decisions not to cover new agents, and some costly products have been able to support their prices with economic data. Still, pharmacoeconomics has not proved to be the panacea many had predicted, unlocking the door to more profitable and value-oriented pricing. In fact, it is often used to slam the profit door shut by internal decision makers who believe they can sell product only with lower prices. MME offers unparalleled expertise and support in the development, implementation, and evaluation of strategies and tactics that focus on the value of your products. We provide guidance in pricing, contracting, reimbursement, and an understanding of payers and providers to help marketing professionals within the pharmaceutical and biotech industries achieve their goals. MME believes that value is an essential element of marketing. We work with our clients to recognize, create and capitalize on opportunities based on the value of their product (and other market considerations?). The depth and breadth of our experience enables us to ensure our clients can identify value drivers from both customer and manufacturer perspectives. Our practice is built solidly upon deep industry knowledge and a reputation for delivering “real-world” solutions. For each engagement we assess opportunities and risks, develop strategic recommendations and help clients to identify and achieve optimal results, no matter what hurdles confront them. We collaborate to construct “value frames” based on the nuances of value perceptions as well as why they matter, how they interact and when they change. Value, every aspect of value, is at the core of our work, and we help each client deliver optimal value to its own customers. In addition to our custom advising and consulting services, MME offers an array of standard approaches and programs to assist clients in the areas of marketing, marketing research, pricing and reimbursement, account management, training and public policy that many clients have come to rely on.